What is the ATHENA Award? Shary Williamson (left) is presented the Athena award by event chair Diane Glassmeyer at the 2018 awards ceremony. 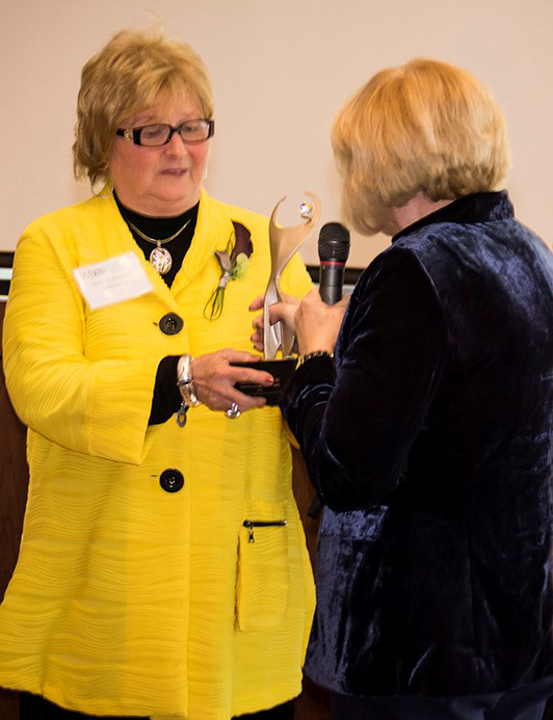 The 22nd ATHENA Award of Excellence will be presented by the Marion Women’s Business Council to a woman of distinction who has demonstrated professional leadership, community service and a passion to assist women in reaching their full leadership potential. This coming year’s recipient will be awarded the ATHENA statue at the luncheon on Monday, March 11, 2019. The event will be held at The Barn at All Occasions, 6989 Waldo-Delaware Road, Waldo, Ohio 43356. The ATHENA Award is intended to recognize outstanding business and professional women in the community and to create an environment where providing assistance, encouragement and mentoring to women would be uniquely valued. The ATHENA Foundation has come to embody the principles of a new kind of leadership reflected in far-reaching initiatives for the future. Click here for additional information or to download a nomination form. Completed forms should be returned to Diane Glassmeyer via email to advocarediane@live.com; or by regular mail to Marion Women’s Business Council, 1499 Lighthouse Ridge, Marion, Ohio 43302. Deadline for all nominations is end of business day Tuesday, January 15, 2019. Any questions may be forwarded to Diane Glassmeyer at 740-225-8284. The Marion Women’s Business Council’s mission is to inspire women to reach their full potential through mentoring, networking, education, and recognition. WBC luncheons are held the second Monday of each month, September through May. Anyone interested in joining may visit www.WomensBusinessCouncil.com for a membership application and a complete program schedule. Those interested in joining are also encouraged to attend a luncheon to find out more.